Silja Manninen and Riitta Hakkarainen are presenting a participatory installation Everywoman with Tiina Erämeri, who is showing her photography series Broken. Opening reception: 31th May 2018, 6-9 pm. Silja Manninen and Riitta Hakkarainen, London based Finnish-Ukrainian and Finnish-Russian designers/artists, have planned a series of collaborative conceptual artworks that touch on themes of femininity, mortality, life and personal journeys. Considering what it means to be an artist today, the artworks will focus on and explore the concept of hidden emotions and identity through collaboration and evolution of the project. Everywoman is an experiential, interactive concept involving a dress or a series of dresses created using mostly up cycled materials that the artists will develop into largescale installations/exhibitions. Presented in public areas, galleries, exhibition spaces and during events promoting inclusivity, sustainability and inviting participation, the project will develop through the involvement of other artists from different creative disciplines and varied audiences in and beyond London. A dress hangs, suspended from the ceiling. Inside a human being’s vital organs are attached to the lining, hanging at various heights. Each organ contains embroidered sentences that suggest what the wearer has been through creating a forensic map of everywoman’s life. Visitors will find the messages indicating and forming a record of a universal human experience and emotion through personal testament. One to three viewers can enter the interactive dress at any given time. Lit inside, the audience are invited to document their own feelings and thoughts onto small notes that are suspended from the embroidered organs. A story of an individual will start to form as the artwork develops and grows through audience participation. Different people become part of the narrative as they read the messages left by others and add their own. 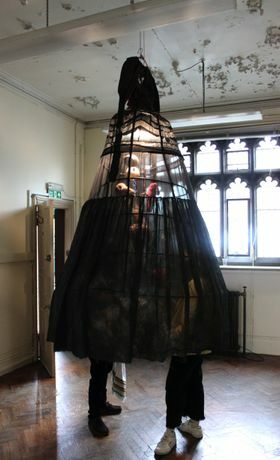 And while an experience of the life lived by a person who once wore the dress starts to slowly emerge, the public begin to experience this life themselves, through the activity of reading and engaging with the piece. A feeling of nostalgia, longing and belonging may come over the viewer, taking him or her to a different emotional or thinking space during the time spent inside the dress. The dress provokes thought and conversation to become a continuing and evolving artwork. For this week-long exhibition at the Norris Raymond store, Manninen and Hakkarainen have teamed up with Finnish-British photography and digital artist Tiina Erämeri. 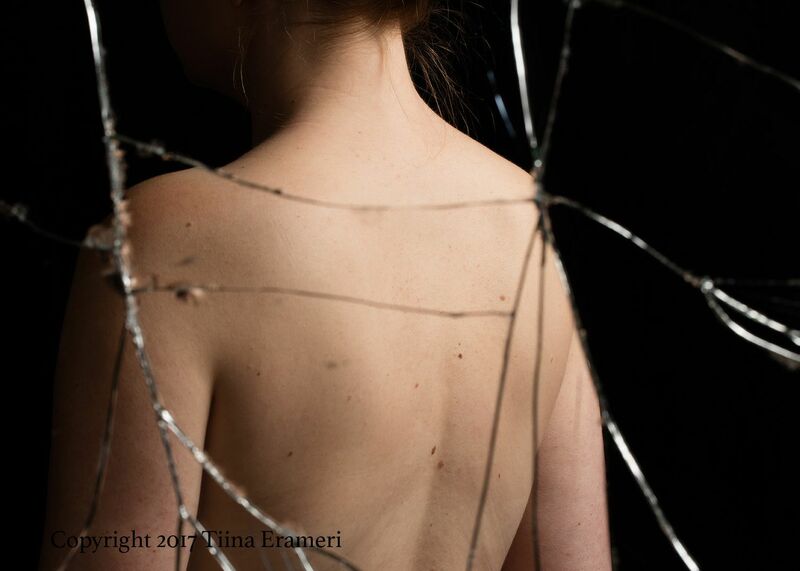 Erämeri will be presenting her series of photographs titled Broken, which explore fragility and perseverance: themes that run through her own experience both creatively and emotionally. Because of the artist’s precarious health she has developed a career as a commercial photographer, in order to allow her to fulfil her lifelong ambition of becoming an artist. Having reached the first goal, Erämeri has embraced her feelings about her body and the impact of her health as assets she is able to reference in her creative practice. Doing this to produce highly personal work, she is able to explore the difficult relationship we all have with our own bodies. This will be the first time Erämeri is exhibiting her work as an artist. Silja Manninen is an MA graduate in Womenswear at Central School Saint Martins. She is a fashion designer with a career spanning 15 years, working as a head designer for international brands, as well as running her own fashion label. She has further developed her career in the field of creative consultation and academic practice. Riitta Hakkarainen is a Finnish Russian multi-disciplinary artist and designer with a background in scenography and art direction in cinema and theatre. She graduated with an MA in Scenography at Central School Saint Martins, before which completing her training at St Petersburgh State Theatre Arts Academy. Tiina Erämeri’s career as a commercial photographer and retoucher spans 18 years. Working mostly in London, and previously in her home country Finland, she graduated from UCA Rochester (Formerly Kent Institute of Art & Design).